leaving the chalk festival on sunday, I ran into two fellows who were having a blast with their bikes and a wall. after their first run up the wall I asked if they'd run the wall again so I could snap a few pics. they happily complied. when viewed as a slide show the result can be considered a little stop action action. in retrospect I'd should have continued snapping until the second bike finished the run, oh well, it's still a good show! wall wednesday continues .... perhaps when i run out of walls, the mouse will start playing wordless wednesday, I just love those alliterations! Great mural! 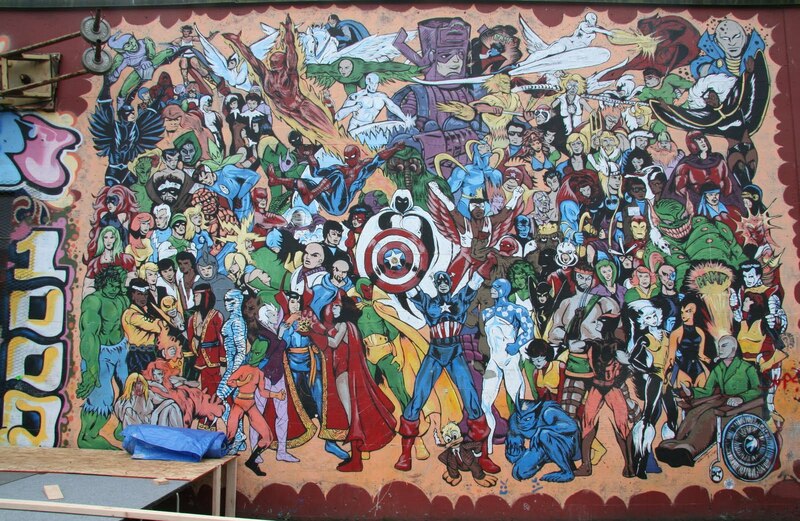 Looks like just about every comics superhero is in there. I WANT THAT MURAL ON MY WALL! Awesome mural....the kids on the bike's are really brave and daring. Makes me wish I was a kid again. Back then I wasn't so brave and daring...but if I had the chance to do it all over again from my age now I'd probably have more guts to try those stunts on the bike. Cool pics...like the stop action. Fantastic mural. I don't want to be the people in that room when one of those kids go through the window. I loved the photos of the boys and their bikes. We are so fearless at that age. I just caught up on all your posts. The mural is amazing.